From the scanner’s Main Menu, press 3 for Settings. Found Item Default Qty: If required, press 1 to change this setting. (recommended) 1: When a barcode is recognized by the scanner, a quantity of one is recorded by default. QOH: When a barcode is recognized by the scanner, the quantity in stock for the product at the time the product file was created is recorded by default. Not Found Item Default Qty: If required, press 2 to change this setting. (recommended) 0: When a barcode is not recognized by the scanner and the Allow Not Found option (below) is enabled, a quantity of zero is recorded by default. 1: When a barcode is not recognized by the scanner and the Allow Not Found option (below) is enabled, a quantity of one is recorded by default. Allow Not Found: If required, press 3 to change this setting. (recommended) N: When a barcode is not recognized by the scanner, the item is not recorded in the scan file. Y: When a barcode is not recognized by the scanner, the item is recorded in the scan file. Exclude Items w/Zero QOH: If required, press 4 to change this setting. Y: Items which were not in stock at the time the product file was created are not recognized by the scanner. (recommended) N: Items which were not in stock at the time the product file was created are recognized by the scanner, and are recorded in the scan file. 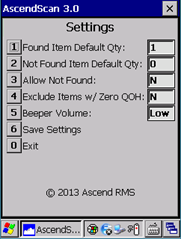 Beeper Volume: Press 5 to adjust the volume of the scanner's audible alert sound. Low: The quietest alert setting. Med: The mid-level alert setting. Hi: The loudest alert setting. Press 6 to save changes. When the Settings have been saved prompt displays, press Enter. Press 0 to exit the Settings screen.